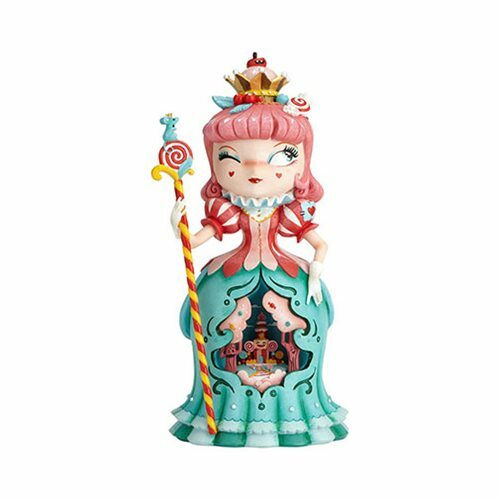 Decked from crown to gown in scrumptious sweets, the Candy Queen is a sight to behold! Handcrafted with exquisite details like peppermint swirls, a magical mouse friend, and a scene of cotton candy trees and a candy house, this marvelous stone resin figurine is painted by hand for a perfect finish. Standing about 10 2/5-inches tall, a The World of Miss Mindy Candy Queen Statue makes a delightful treat for sweet-hearted girls and boys. The World of Miss Mindy combines mythical characters with the unique design twists of its eponymous artist. Her cartoon folk-art style puts a fresh whimsical bent to childhood fantasies, painting timeless themes in a modern light. Requires 2x "LR44" batteries, included.